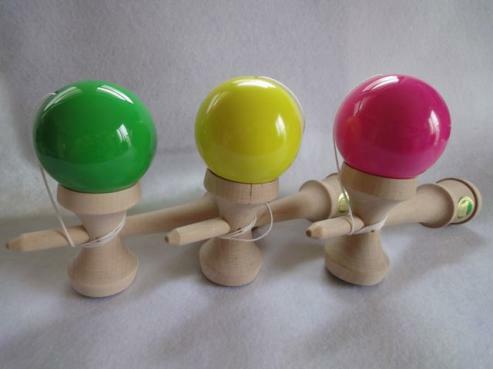 These beautifully hand-crafted kendama are officially sanctioned by the Japanese Kendama Association. They use non-toxic materials and are made in Japan. Now available in Pink, Green, and Yellow! The TK 16 Master weighs about 145g, making it one of the heavier models and the weight gives good stability and a very solid feel. The string is attached to the stick in an indentation beneath the cup body so the knot cannot be seen. 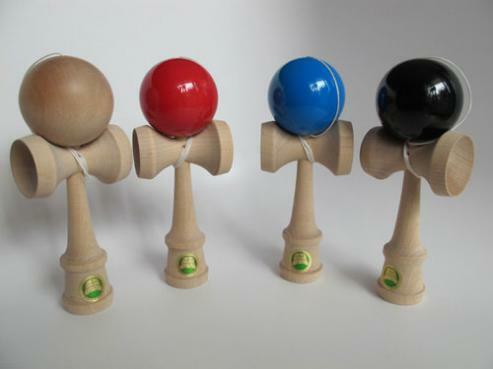 This kendama comes in a plastic bag that contains an extra string. Kendama (known in English as cup and ball) is a traditional Japanese game of skill where you try to catch the ball in one of the three cups or on the spike, while performing a variety of tricks and wrist flicks.